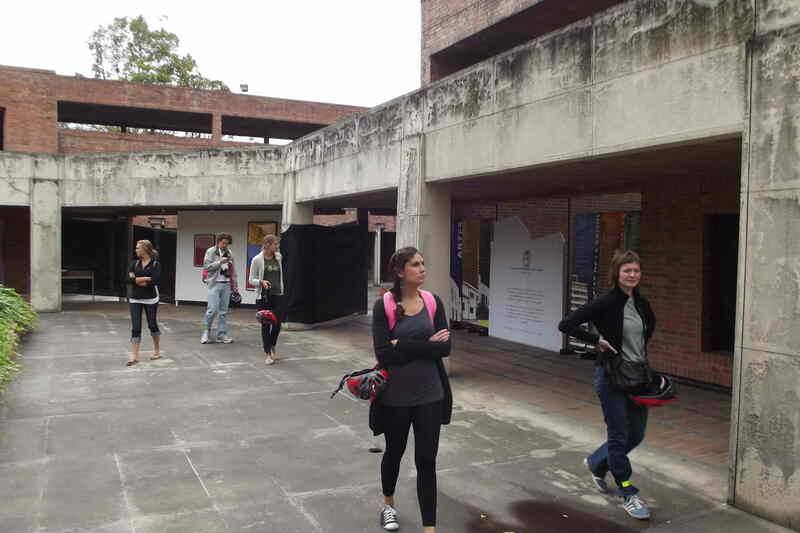 ← Bullfighting on Bogotá’s Beach! The spot on Seventh Ave, just south of Jimenez, where Jorge Eliecer Gaitan was assassinated in 1948. 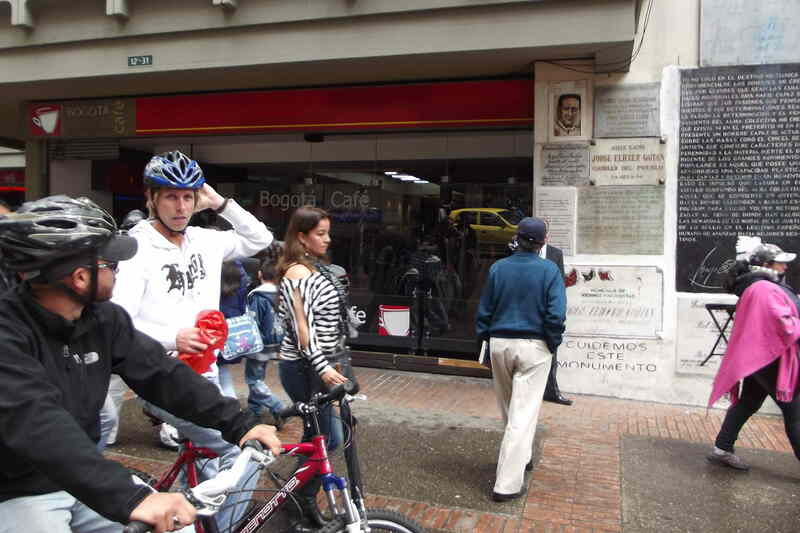 We often talk about Bogotá’s dramatic and violent history during our bike tours, and a figure whose tragic story hangs over Bogotá is Jorge Eliecer Gaitan, the populist presidential candidate. 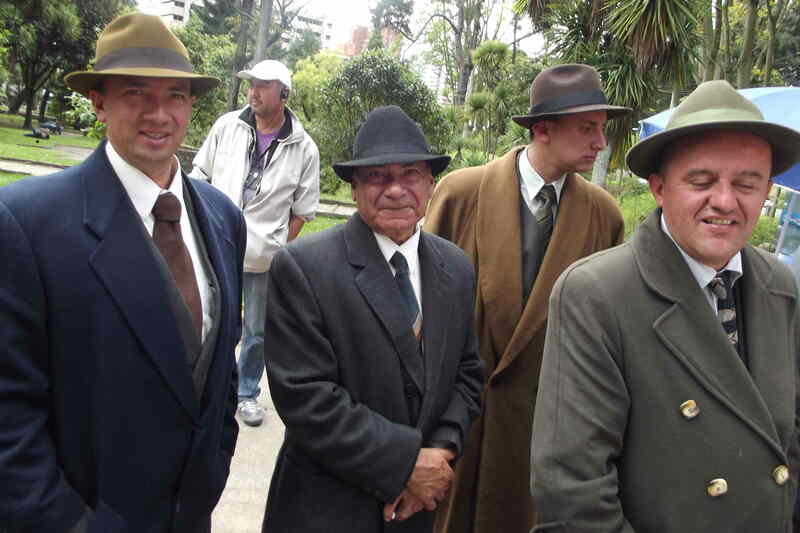 His assassination in downtown in April 1948 triggered the Bogotazo riots, which leveled much of the city. 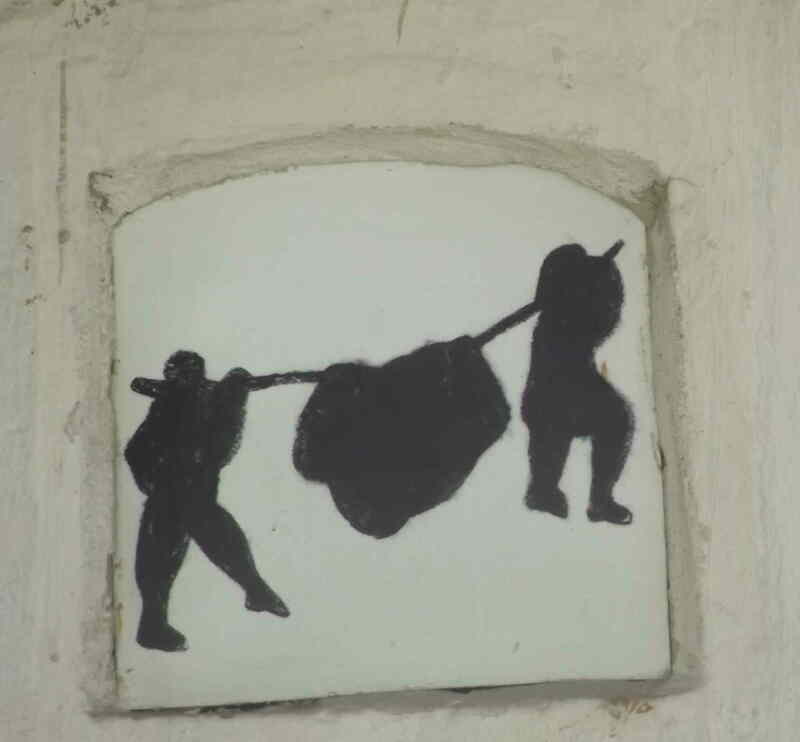 Along our tour routes, we often visit landmarks related to Gaitan’s story, including the spot on Seventh Ave. where he was shot down by a mentally ill man, the Plaza de Toros, where he announced his first presidential candidacy in 1945, and Gaitan’s home in Teusaquillo, now a museum. 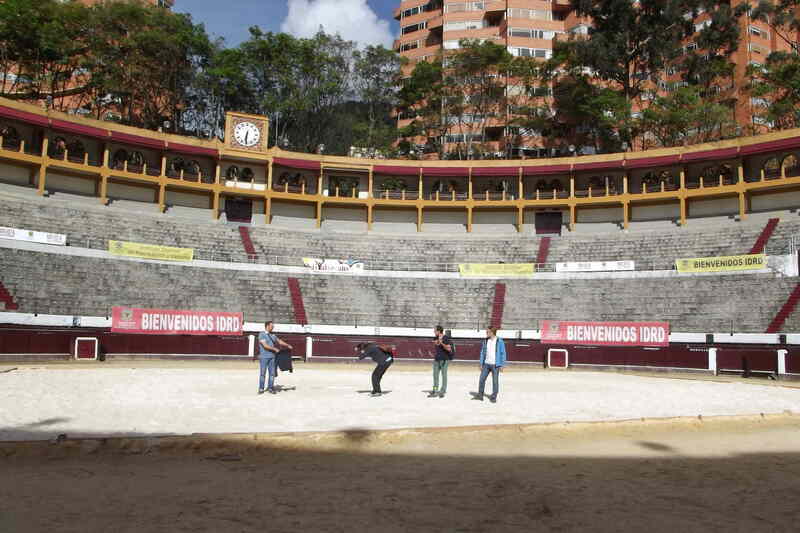 Playing bullfighter in the Plaza de Toros Santamaria, where Gaitan announced his candidacy for president in 1945. An assassin prevented him from repeating the run. 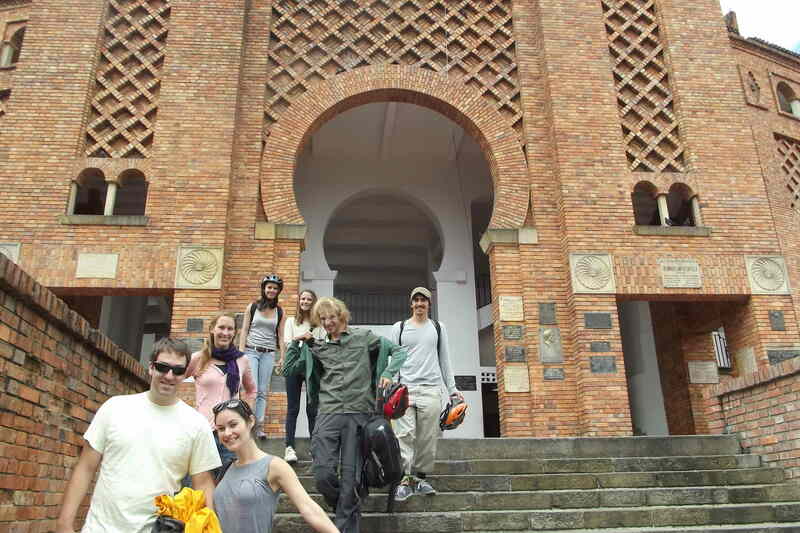 Visitors leaving the bullfighting stadium, with its moorish architecture. 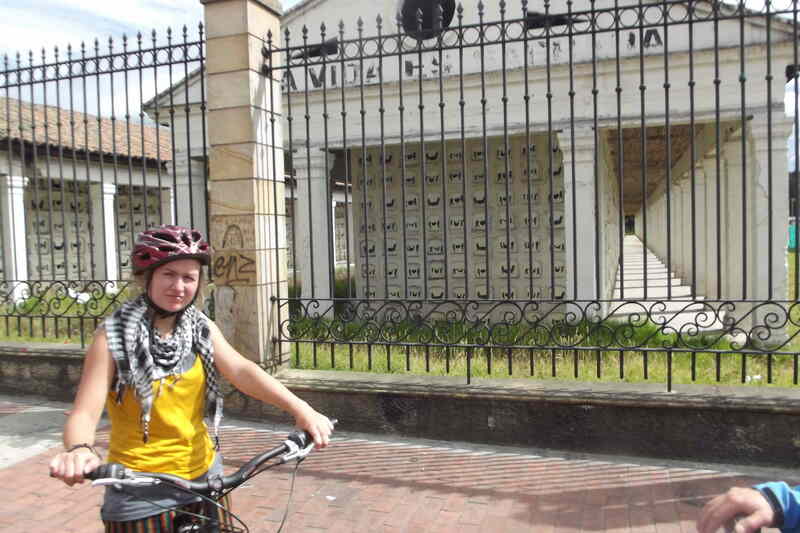 This area of mausoleums near the Central Cemetery is believed to contain mass graves containing victims of the Bogotazo riots, which followed Gaitan’s assassination. 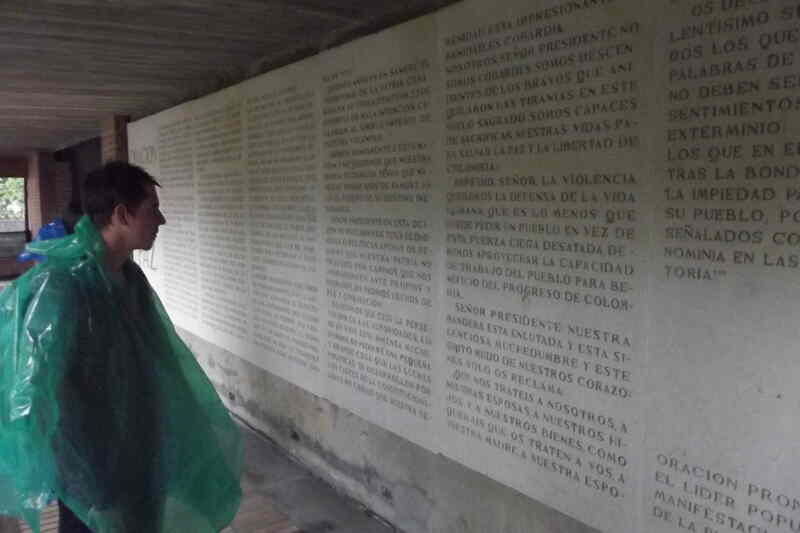 The images painted on the thousands of empty mausoleums represent victims of Colombia’s violence. 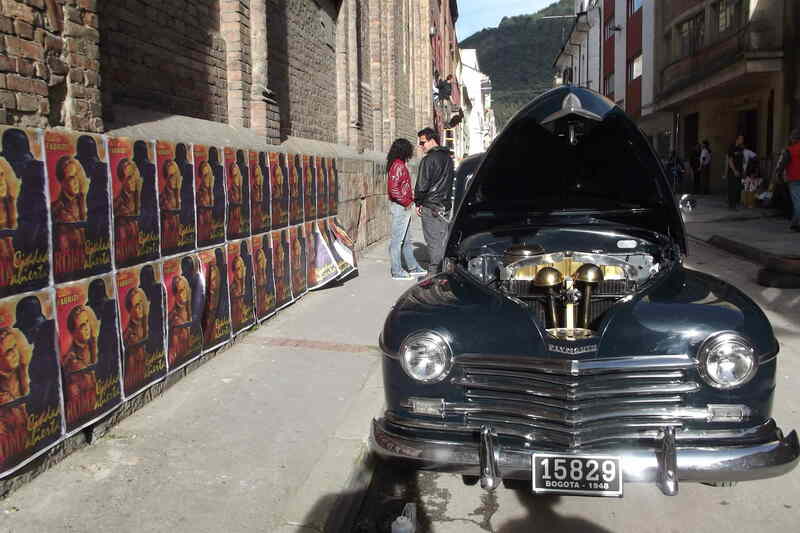 A 1940s-era car being used for a movie shooting about Gaitan’s assassination. 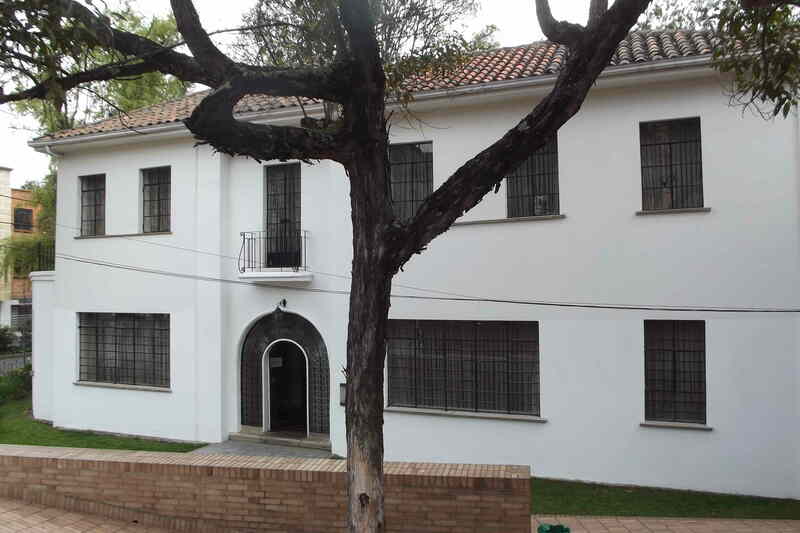 Gaitan’s home in Teusaquillo, which is now a museum. 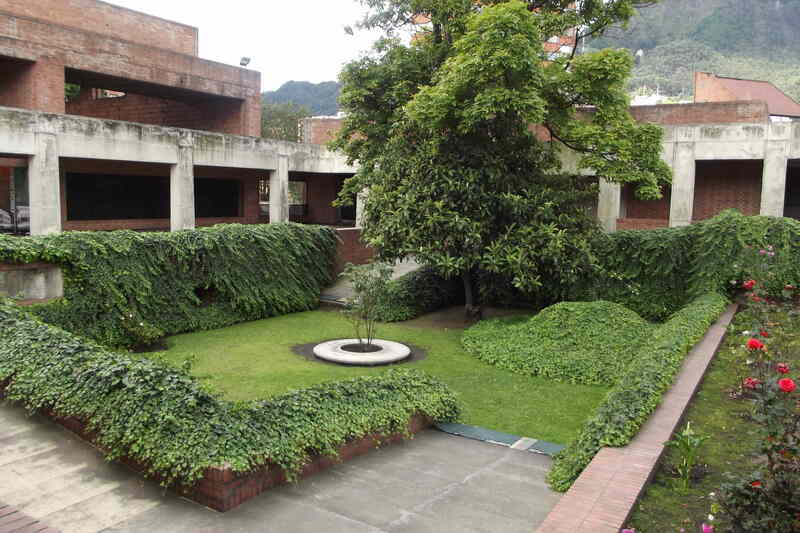 Gaitan’s tomb, by his house. Gaitan was buried standing up, because his supporters wanted ‘to plant his ideas, instead of burying them.’ He also faces the city of Santa Marta, where Simon Bolivar died. An old streetcar is parked beside Gaitan’s home. 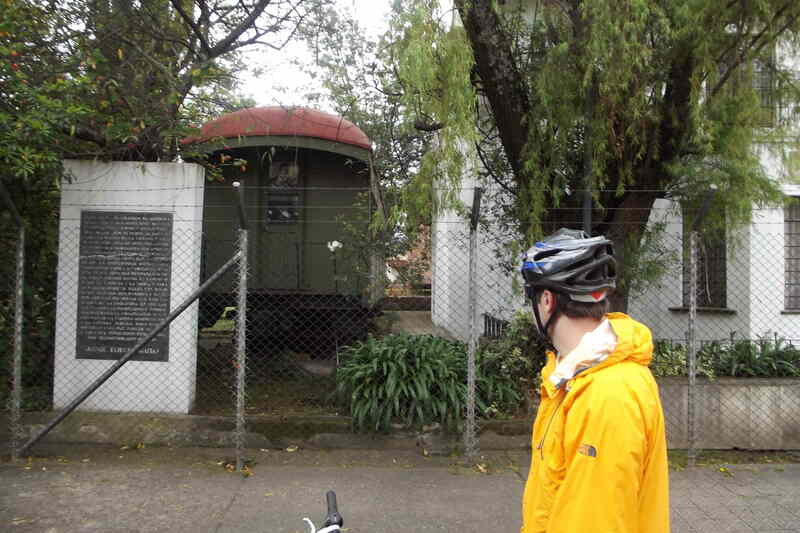 Bogotá’s old streetcars, or tranvias, were perhaps the most prominent victims of the bogotazo rioters. The ‘Prayer for Peace’ was one of Gaitan’s most famous speeches. 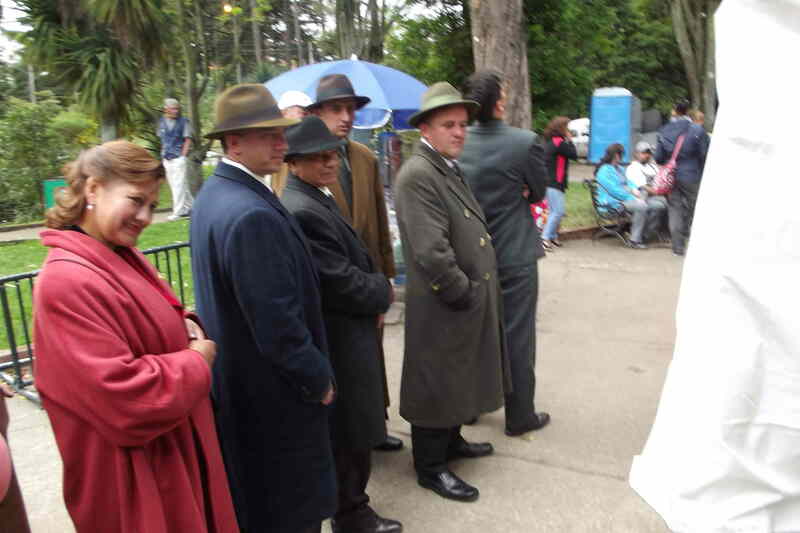 Extras in period costumes in the National Park during a filming of a movie about Gaitan.